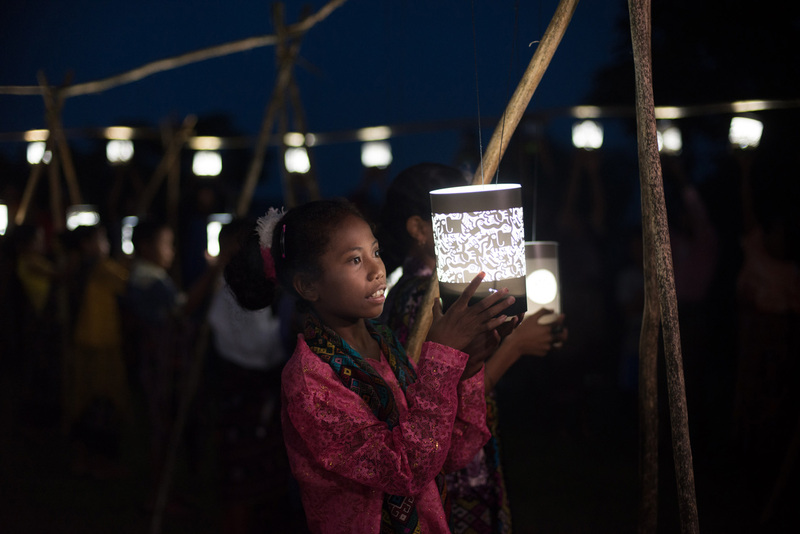 At the end of February 2015, a lantern donation and lighting ceremony was held in the village of Sone, in Indonesia's West Timor, as part of a related project. The “Cut Out the Darkness” project, a part of Panasonic Corporation's “100 Thousand Solar Lanterns Project”, delivers solar lanterns with lantern shades designed by people from around the world, in the hope of learning about the challenges of living in areas that have no electricity. Child looking at the animal lit by the lantern's light. Working by the light of a solar lantern. We received many positive comments, like "We now have more time to spend with our families." At the lantern-lighting ceremony, all kinds of animal designs on the shades appeared suddenly, as if floating in the air, when the solar lanterns were turned on. The theme was a “Zoo of Light.” View the moment of “Lantern’zoo”. 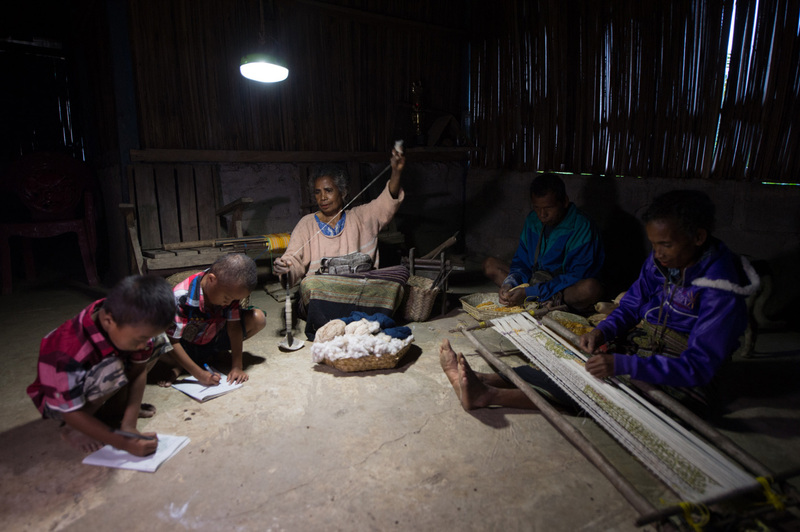 For this ceremony, 110 of the 1,010 solar lanterns donated to Indonesia through the main Project in fiscal 2014 were donated to the people of Sone through an NGO named Kopernik. The designs for the shades were chosen by popular votes online from among many submissions. 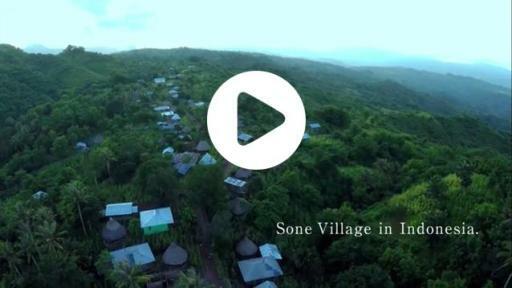 The village of Sone is completely off the electricity grid. Located close to a mountain summit, and with a population of about 700 people, Sone is known for its production of traditional fabrics. 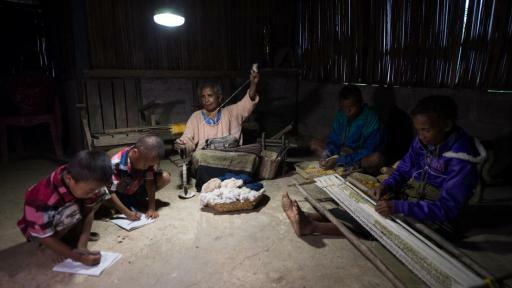 In the past, hand-weaving work by the light of kerosene lamps at night was inefficient, strained the eyes, and exposed households to health risks from the kerosene smoke. The threat of house fires from the flame of the lamp was always present. 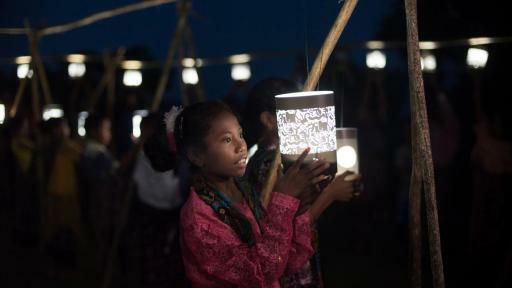 The newly-donated solar lanterns can be charged by sunlight during the day and then used at night. 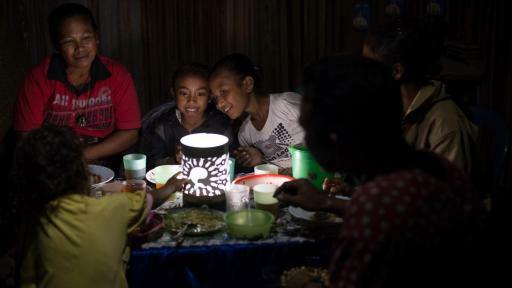 Panasonic plans to continue working on the “100 Thousand Solar Lanterns Project” as part of its efforts to pursue “A Better Life, A Better World” and to contribute to the achievement of the United Nations Millennium Development Goals (MDGs).